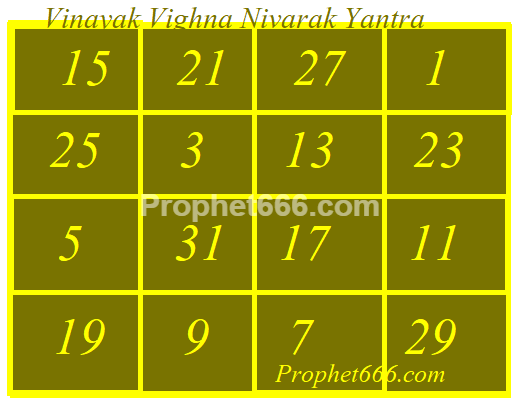 In this post, I have written about the procedure of making the Vinayak Vighna Nivarak Yantra or the Yantra dedicated to Ganesha to remove all hurdles, which are hindering progress and bless him with knowledge, money, wealth and good physical and mental health. Vinayaka is a popular and famous name of Ganesha, as the remover of all obstacles. 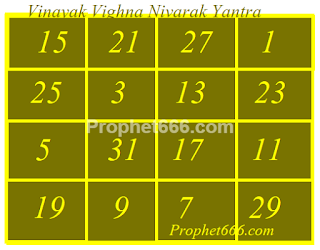 1] The Vinayak Yantra can be prepared on any auspicious date or festival or on any Wednesday. We are at present in the most auspicious period of the festival of Ganesh Chaturthi, which commenced on the 25th of August 2017 and concludes on the day of Anant Charurdashi on the 5th of September 2017. The festival of Ganesh Chaturthi also called as Vinavak Chaturthi is a most auspicious period to undertake any kind of worship related to Ganesha, including the start of any Mantra or Yantra Sadhana dedicated to Ganesha. 2] The Yantra shown in the image can be drawn on a Bhojpatra using Ashtagandha or Raktachandana Paste, using a wooden stick. It can also be prepared on Gold, Coral Stone or Spathik. 3] The Yantra should be placed on a Puja Board on a Yellow Colored Piece of Cloth in the North East Direction and the practitioner should sit in-front it and chant any preferred Mantra of Ganesha 1021 times using a Haldi, Coral Beads of Rudraksha Japa Mala. 5] Each day, the practitioner should offer a Prasad of Jaggery and Dried Coconut Pieces or Fried Modak to the Vinayak Yantra. 4] The Vinayak Yantra Sadhana is of 21 days, after which the Yantra should be worn around the neck as an Obstacle Removing Talisman. Note- Maintain a Sativk lifestyle during these 21 days and abstain from alcohol and non-veg food. अपरिहार्य है .यह चौसठI यंत्र बहुत प्रभावशाली है .यंत्र निर्माण के बाद पंचोपचार से पूजा कर लेनी चाहिए .दिए गये मंत्र के अलावा गण्पत्यथर्वशीर्ष / संकट नाशन गणेश स्तोत्र या अन्य गण्पति स्तोत्र / मंत्र का भी पाठकिया जा सकता है .ऋणग्रस्त व्यक्ति 'ऋणहर गणेश स्तोत्र 'पढ़ें . 'महागणपति वज्र पंजर कवच 'पढ़ें,जिससे "यँ यँ कामयते कामम तम तम प्राप्नोति पाठत :" या फिर हरिद्रा गणेश कवच का पाठ करें ,सर्व विघ्न विनाशक ,सर्व सिद्धिकर,सर्व शत्रु क्षयंकर,ग्रह पीड़ा आदि नाशक है . ek samasya hai , uske liye koi upaay bataye. Ek property pe kiraye dar rehte hai aur woh jagah chod nahi rahe , badmash hai . Paisey maang rahe hai . शनिवार की शाम को भोजपत्र पर लाल चंदन से किरायेदार का नाम लिखकर शहद मे डुबो दें .संभव हो तो यह क्रिया शनिश्चरि अमावस्या को करें .ध्यान रहे,यह क्रिया करते समय कोई टोके नही . कार्तवीर्यार्जुन मंत्र इसमे उपयोगी सिद्ध हो सकता है .यह मंत्र हाथ से निकली धन,संपत्ति ,खोया पद ,गौरव ,लापता व्यक्ति आदि की प्राप्ति से संबंधित है . जानकारी भेज दी जाएगी . Satyavati was a fisherman's daughter and was given a mantra by parashar rishi to evoke beautiful fragrance from her body. Pls guruji provide mantra to smell like fragrance.